Hello, forex chaps! The U.K. will be releasing its GDP report this Friday at 9:30 am GMT. There’s therefore a chance that the pound may get a volatility boost. And if you’re planning to trade this top-tier report, then you better gear up by reading up on today’s Forex Preview. Oh, for those who don’t know, there are two kinds of quarterly U.K. GDP reports: (1) the first estimate or preliminary report and (2) the second estimate or final GDP report. And as it says on the title, the upcoming GDP report is the first or preliminary estimate. The first or preliminary report, as the name suggests, gives the earliest peek at the overall economic activity in the U.K., so it usually generates some volatility. However, the preliminary GDP report is also the least accurate and is often subject to revisions. The first estimate for the U.K.’s Q3 GDP growth was released way back on August 10. And that revealed that the British economy grew by 0.4% quarter-on-quarter in Q2, which is faster compared to Q1’s 0.2% growth, but is within expectations and is therefore not too impressive. The details were not too impressive, though, since private consumption weakened (+0.4% vs. +0.5% previous), business investment fell further (-0.7% vs, -0.5% previous), and exports slumped (-2.2% vs. -0.8% previous). Moreover, the year-on-year reading came in at 1.2%, which is a tick slower compared to the expected 1.3% increase. However, the 1.2% increase in Q2 is still stronger compared to Q1’s 1.1%. Also, the details for the year-on-year reading were positive overall since many GDP components printed stronger readings. The only disappointment was the 0.2% decrease in business investment since that’s the first negative reading in six quarters. To summarize, the preliminary Q2 GDP report was mixed and the quarter-on-quarter reading was within expectations, so the pound barely reacted and the Q2 GDP report was essentially a dud. However, the GDP report did seem to inspire some follow-through buying later, probably because the 0.4% quarter-on-quarter rate of expansion is also meeting the BOE forecast, as reported in the August 2018 BOE Inflation Report. Buying pressure was only short-lived, though, since Brexit-related concerns were weighing down on the pound at the time. What’s expected this time around? 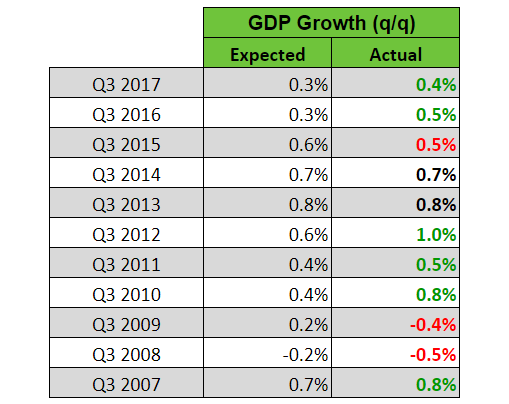 For tomorrow’s GDP report, the general consensus is that Q3 GDP expanded by 0.6%, which is stronger compared to the 0.4% recorded in Q2. The year-on-year reading, meanwhile, is expected to come in at 1.5%, which is also a stronger reading compared to Q2’s 1.2% annual increase. Total retail sales volume for all of Q3 2018 is 1.2% higher compared to Q2 2018, so consumer spending will likely have a larger contribution to Q3 GDP growth. We don’t have the September trade report yet. But so far, the available data for July and August point to the possibility that trade may be a drag. Sure, exports increased by 1.41% in July and 1.15% in August, but imports increased by 0.62% in July and surged by 2.41% in August. The U.K.’s monthly GDP report uses the output approach rather than that expenditure approach. With that said, GDP grew by 0.3% month-on-month in July but was flat in August. There are no apparent trends when comparing the GDP readings for Q3 and Q2. However, economists seem to be too pessimistic with their guesstimates since there are more upside surprises over the year. It’s worth pointing out, though, that the historical tendency has weakened in recent years. In summary, there is a consensus that the British economy strengthened in Q3, and the leading reports and available GDP components point to stronger economic growth in Q3, which support the consensus view (for the quarterly reading at least). Historical data don’t really support or go against the consensus view, but economists do appear to have a tendency to undershoot their guesstimates since there are more upside surprises over the years. And that skews probability more towards a possible upside surprise. But as always, just keep in mind that we’re playing with probabilities here, so there’s always a chance that the actual reading may surprise to the downside instead. At any rate, do note that traders usually have a knee-jerk reaction to the actual reading for quarterly GDP growth, with an upside surprise usually enticing buyers, while a downside surprise usually attracts sellers. Also, make sure to keep an eye and ear out for any Brexit-related reports since the pound has been more sensitive to Brexit-related updates lately.